There is perhaps nothing more fun than forgetting all your worries and having a good old boogie; it’s one of the oldest and best ways to stay active, healthy and happy. And you’re never too old or even too young to start trying out your moves on the dance floor or even consider it a career and master dances such as the jive. For one talented two-year-old this is exactly what he wanted to do when a classic Elvis song came on. After watching his parents Kristina and Peter Stokkebroe practice with the other dancers at Studie43 he’s clearly picked up some moves and is eager to show everyone what he has learnt. 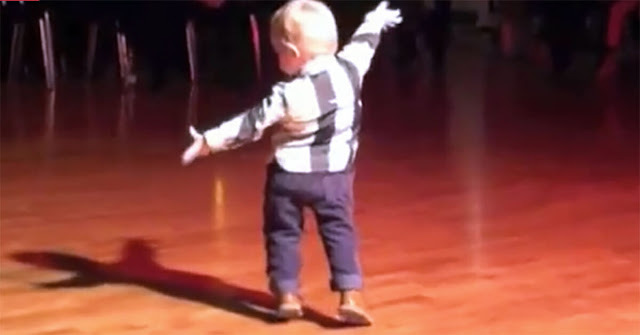 He immediately starts dancing and I cannot stop watching the video below; I can’t believe he’s only two years old! He even gives a very proud bow and a kiss to the crowd at the end. This talented tot has such a bright future ahead of him. I’m eager to see more of his incredible and entertaining moves. Please share this adorable story with your friends and help brighten their day.